Location: Dromore Wood Nature Reserve, Ruan, County Clare. Originally part of a private estate belonging to the Crowe Family, Dromore Wood was acquired by the state in the 1940’s and worked as a commercial forest. During the 1980’s, The National Parks and Wildlife Service (NPWS) took over the management of Dromore with an emphasis on the regeneration of native species. In 1985, it became a statutory Nature Reserve. Covering an area of approximately one thousand acres Dromore Wood has all the attributes necessary for the perfect Nature Reserve. 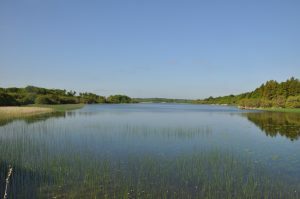 These include rivers, lakes, turloughs and callows (meadows that flood during winter), limestone pavement, fen peat, reed and rush beds and vast areas of species-rich woodland. The area comprises perfect habitat for a huge variety of flora and fauna species. As well as the natural, the Reserve also has an historical and archaeological aspect. 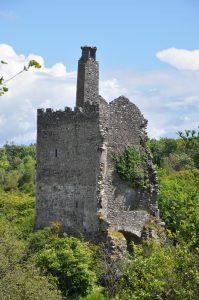 The 17th century O’Brien castle stands by the lake edge. There are also the sites of Cahermacrea Castle and Kilakee Church, two ring forts, a limekiln, a children’s burial ground and a chapel. Dromore Wood has long had a reputation as a stronghold of the rare and elusive Pine Marten. You may not see a Pine Marten, they are mainly nocturnal, but along the various trails and paths in the Reserve, their scats (droppings) are regularly seen. A study of the Dromore martens during the 1970’s by Warner and O’Sullivan is still regarded as a major reference for the species. Despite a decrease in Red Squirrel numbers countrywide, there remains a healthy population in Dromore Wood and they are regularly observed as they feed on the ripening hazel crop. There are also a number of active Badger sets within the Reserve, and Stoat, Fox and Hares are commonly seen as are the smaller mammals such as Shrews and Woodmice. At least eight of the nine species of Irish bats are known to inhabit the area of Dromore and there are a number of bat roosts both within and on the perimeter of the wood. Throughout the year, berries, fruits and nuts which grow freely in Dromore Wood provide an essential food source for Badgers, Squirrels and other mammals as well as numerous species of birds. The River Fergus runs alongside the Reserve and feeds the lakes situated within the boundaries. These lakes are perfect habitat for Otters, Coots, grebe species, Moorhen, Water Rail and Heron. During the winter, the lakes flood and vast flocks of Teal and Wigeon along with Goldeneye and Tufted Duck, Pochard and Shoveler amongst others, join the resident population to feed on the flooded meadows. Whooper Swans are frequent winter visitors as was a White-tailed Eagle for a few days of winter 2011/12. 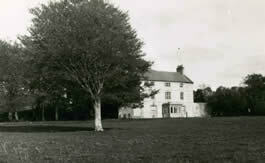 The Crowe family were living at Nutfield near Ennis, Co Clare in the 1780s. Burke records that Thomas Crowe, second son of Robert Crowe of Nutfield married a Miss Wainwright of Dublin and had a son Thomas Crowe of The Abbey, Ennis. He married Ellen Tymons and had six sons and four daughters. The eldest son Thomas Crowe, born in 1803 became a barrister and lived at Dromore House, parish of Ruan, barony of Inchiquin which he owned in fee. In 1838 he married Isabella Hume of Humewood County Wicklow. In the mid 19th century Thomas Crowe held land in seven baronies of County Clare but the main part of his estate was concentrated in the parishes of Ruan and Inagh barony of Inchiquin and in the parishes of Kilfarboy, Killard and Kilmurry, barony of Ilbricken. In 1857 he bought over two thousand acres of the estate of the Marquis of Thomond in the barony of Inchiquin. His youngest brother Wainwright Crowe lived in Cahircalla, parish of Drumcliff, barony of Islands. In the 1870s Thomas Crowe of Dromore owned 6,121 acres in County Clare and the respresentatives of his brother Wainwright Crowe owned a further 3,126 acres. By 1909 Wainwright F. Crowe had agreed to sell over 1,600 acres to the congested District’s Board. The mansion house of Dromore and almost 1,000 acres of untenanted land was still in the possession of the Crowe’s in 1906. Thomas Crowe’s grandson, another Thomas Crowe, sold Dromore in 1936.